FREDERICK, MD. – Leaders of the International Council of Aircraft Owner and Pilot Associations (IAOPA), representing more than 400,000 general aviation aircraft owners and pilots, convened in New Zealand earlier this month for their twenty-ninth biennial World Assembly to discuss challenges facing the general aviation community around the globe. The assembly highlighted global medical reform, new and emerging technologies, benefits of PBN, and challenges and opportunities with UAS. "As the reach for IAOPA continues to expand, the voice of general aviation has never been more united than it is this year gathering in New Zealand," said IAOPA President Mark Baker of the bi-annual meeting. "We all come from different places and face unique challenges, but we all share a common passion for flight," Baker told the delegates. The World Assembly produced a series of resolutions to guide IAOPA and its affiliates moving forward. Significant among the 11 resolutions were initiatives related to medical reform, new and emerging technologies and ADS-B. "Our work here will help advance general aviation long after we've all returned home to our own countries," Baker said in World Assembly closing remarks. "I want to thank each of you for your participation, contributions, and support of IAOPA and our shared interests." The full text of all IAOPA World Assembly resolutions and presentations will be posted shortly to the IAOPA website at www.iaopa.org. Photos from the event can be viewed on the WA website, to post your pictures send them to photos@iaopa2018.com. to extend its deepest gratitude to all of the dedicated AOPA New Zealand personnel and members for their work in hosting the Assembly, including President Ian Andrews, Mary Bruce, Phillipa Shurmer, Angela Hunter, and the other members of AOPA New Zealand that worked so tirelessly to make the event a success. That: All IAOPA affiliates encourage National Aviation Authorities worldwide to implement proportionate risk based relevant to the activity regulation for General Aviation swiftly and without unnecessary delay, following the example of the EASA General Aviation Roadmap, and to encourage continued support for their further development. Also: All IAOPA affiliates encourage National Aviation Authorities, as part of a performance review, to gather meaningful statistics to assess the impact of proportionate risk based relevant to the activity regulation on both the safety and economy of the General Aviation Industry. Secretary General to work with the sponsor to formulate a suitably worded resolution. Further Resolved that the IAOPA Affiliates will provide such collaborative assistance and resources as are necessary to support the IAOPA Secretary General in carrying out the instructions of this Resolution. As new technology becomes available, including low cost portable solutions, such as ADS-B and SWIM (system wide information management), national AOPAs /IAOPA should encourage State airspace regulators to remove controlled airspace where technology is able to provide the solutions for known/known intent environment. The benefit for General Aviation could be more efficient flight profiles through greater access to airspace - this will lead to lower fuel burn, reduce emissions and lower environmental impact. To encourage all national AOPA's to promote their membership of IAOPA at all times - being seen to be a member of the world's largest pilots’ association has many benefits when working at the local level and IAOPA should encourage national AOPA's to make use of all resolutions when discussing GA with national regulators. to remember Marcel Felton, who was the European senior Vice President during the 1990s, for his dedication to GA in Europe and who sadly recently passed away. to remember Captain Geronimo "Gerry" Amurao, who was the IAOPA Pacific Region Vice President during the 1990s and 2000's, for his dedication to GA in the Pacific Region and who sadly recently passed away. Note: Two IAOPA Service Awards will be presented to their recipients at a later date to be announced. ICAO's Secretary General Dr. Fang Liu opened the International Council of Aircraft Owner and Pilot Association's (IAOPA) World Assembly in Queenstown, New Zealand earlier this week, where she took advantage of the opportunity to encourage representatives of general aviation to be more proactive in their ongoing contributions to ICAO's work. "ICAO remains fully committed to safeguarding the fundamental global interoperability of civil aviation, a key aspect of why aircraft operations have become such an incredible force for peace and economic prosperity in the world," Dr. Liu explained. "However, when civil aviation authorities fail to take into account the differences between commercial air transport and general aviation, the results can too often be the over-regulation of the general aviation sector. This significantly constrains its ability to grow, and to thrive. Fortunately, ICAO and the general aviation sector have already established a very healthy and productive level of collaboration to address these and other issues." While in New Zealand, Dr. Liu met with Mr. Peter Mersi, Chief Executive and Secretary for Transport of the country's Ministry of Transport, and Mr. Graeme Harris, Director of Civil Aviation and Chief Executive Officer of its Civil Aviation Authority. The discussions focused on the development of civil aviation to support the United Nations' Agenda 2030 Sustainable Development Goals, and further areas of joint cooperation through ICAO's platforms with respect to the technical assistance now needed in various Pacific Island States. EUROCAE and the International Council of Aircraft Owner and Pilot Associations (IAOPA) formalized and signed agreements on March 26th concerning the inclusions of general aviation in the development of standards in a Memorandum of Understanding (MOU). The collaboration between EUROCAE and IAOPA Europe will focus on the exchanging of general and technical information; sharing of expertise and best practices; participating in each other's working groups; and coordinating communication activities. IAOPA Secretary General Craig Spence said, "It's great to see that general aviation will have a strong voice and representation in issues that are impacting the community every day. We applaud EUROCAE for their willingness to include IAOPA in developing these standards and look forward to a long lasting and successful alliance." Christian Schleifer, EUROCAE's Secretary General, said: "IAOPA is filling the gap in our standard developing activities, representing the general aviation as a sector with specific needs and a large community of airspace users - the private pilots, which is needed to shape the standards to comply with the regulation. As an active private pilot myself, I couldn't see a better fit for this role as IAOPA and I'm personally very happy to work with the IAOPA team in this partnership"
The new partnership will allow EUROCAE to benefit from the practical aviation expertise of the IAOPA membership in the drafting of new standards while simultaneously addressing global aviation challenges. COPA will host general aviation advocates from 78 countries in the summer of 2020 in Montreal as host of the 30th annual World Assembly of the International Aircraft Owners and Pilots Association (IAOPA). 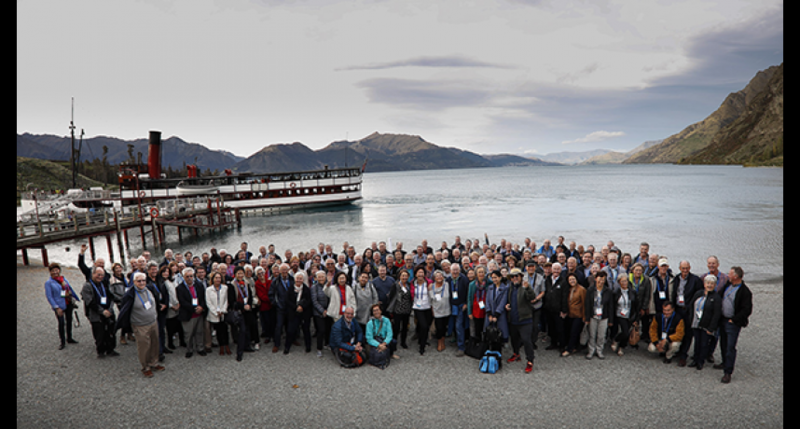 The meeting will be held from June 29 to July 4 it was announced at the 29th meeting of the group being held at Queenstown, New Zealand this week. "I am excited to relay the news... the delegates at the 29th World Assembly presently in NZ have accepted our invitation and have voted in favor of holding the next meeting in Montreal, June 29- July 4 2020," said COPA President Bernard Gervais, who is attending the Queenstown meeting. "This is a great opportunity to promote general aviation and COPA/Canada on the world GA stage." COPA is the second largest of the 79-member groups behind AOPA in the U.S. and the worldwide representation of IAOPA groups is more than 400,000 members. The groups are defined as "autonomous, nongovernmental, national general aviation organizations" whose members fit the ICAO definition of general aviation as "all civil aviation operations other than scheduled air services and non-scheduled air transport operations for remuneration or hire." More details will be released as the event draws closer. Pictured above: Bernard Gervais and Dr. Fang Liu, Secretary General of ICAO, at the 29th Annual World Assembly of IAOPA in Queenstown NZ. Nothing can keep existing members, and attract new members, like reminding them of the great work that IAOPA affiliates, and IAOPA, are doing on national, regional, and international levels to keep them flying. Great work is being done in all parts of the globe to advance the interests of general aviation, and the best way to share that message is to make sure that this newsletter gets to as many members, and non-members alike. So, I encourage you to publish this on your website, send on via email to your members, and do what you can to help spread the word. Our focus with the e-News is to let the world know what IAOPA Affiliate around the globe are doing to keep general aviation flying. Each affiliate of IAOPA is encouraged to submit stories that we can post in e-News to share your successes so that others can benefit. Stories should be directed to the Secretary General, contact IAOPA HQ if you need additional information or have any questions. The International Council of Aircraft Owner and Pilot Associations represent the interests of more than 400,000 pilots and aircraft owners in 79 countries. Formed in 1962, IAOPA is dedicated to promoting the peaceful uses of general aviation and aerial work worldwide. IAOPA eNews is published monthly by the International Council of Aircraft Owner and Pilot Associations for the use of its affiliate members in representing and advocating general aviation and aerial work interests worldwide. Pentru a salva acest document, completeaza formularul de mai jos. Link-ul de download va fi trimis pe email (verifica si in SPAM).